Speaking of blazing, enjoy the island atmosphere of the very cool RedFrog Rum Bar, or south-of-the-border taco goodness at BlueIguana Cantina. There’s always family fun in the air at Hasbro, The Game Show and ha-ha hilarity at the Punchliner Comedy Club. Don’t forget the ambiance of Guy’s Burger Joint – roadside-burger-shack style – featuring hot-off-the-grill burgers designed by celebrity chef Guy Fieri! There are many fish in the sea, and Bonsai Sushi proves it. The steakhouse prides itself on premium cuts, cooked exactly the way you like ’em… plus gourmet appetizers and wine pairings. And to go just a little less refined, stop by Pizza Pirate for a hot slice, the Carnival Deli for a true classic, or Guy’s Pig & Anchor Bar-B-Que Smokehouse to get a little messy with some signature – you guessed it – Guy Fieri BBQ. On this ship, you just canÂt get enough Guy! after pampering yourself at Cloud 9 Spa, of course. Keep the fun going once the sun’s done for the day – have a truly moving experience at the multi-dimensional Thrill Theater, get your lips movin’ up on stage at Lip Sync Battle, dance in your seat at Playlist Productions… or if you prefer to do your dancing on a dance floor, check out Liquid Nightclub. Speaking of liquid, the Alchemy Bar serves up cocktail concoctions made with ingredients a little less ordinary – essence of flaming citrus peel, anyone? If you notice a bit of the outdoors inside, don’t adjust your view. Carnival Breeze’s staterooms – and many of the public spaces around the ship – feature a scintillating tropical dÃ©cor and contemporary furnishings thatÂll transport you straight to warm Caribbean bliss. 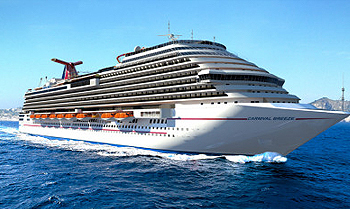 View all Carnival Breeze cruises or view more options for Carnival cruises. A multi-part meal that’s simply coursing with flavor. Enjoy a premium steak served in an atmosphere to match. SeaDogs is more than just hot dogs – it’s a tasty SportSquare snack, topped with a delicious sea view. Always fresh, always al dente, always delicious – this is made-to-order pasta at its finest. Comfort food never tasted so good. Stop on by and see what we have cookin’. Follow your nose to this authentic delight, which will satisfy you like naan other. At SportsSquare, there’s a game for you… and a champion inside of you. This club O2, the just for teens hangout on board Carnival. Taste what happens when our chefs demonstrates how they make some of your favorite onboard foods. In the atrium, you’ll get help from guest services, plan some fun at the shore excursion desk, not to mention enjoy FunHub stations, a full bar, an entertainer’s stage, dance floor and more. The atrium is the space to get together under a distinctive night-sky ceiling featuring ambient lighting from floating lanterns. RedFrog Pub is Carnival’s laid-back, no-worries, British-West-Indies-meets-Key-West-style bar. If that sounds like a mouthful, don’t worry… there definitely won’t be a test! RedFrog Pub is also home to Carnival’s exclusive house brew, ThirstyFrog Red, and mouth-watering Caribbean-inspired fare. Ready to get hungry? Inside RedFrog Pub, Carnival’s British-West-Indies-meets-Key-West-style bar, you’ll find a great atmosphere perfectly tuned for a high level of carefree fun, and outside, you’ll find even more island ambience. If water is your thing, WaterWorks is your place. This onboard water park features two amazing waterslides: Drainpipe and Twister. At the center of Carnival WaterWorks is a giant – we’re talking 300-gallons-giant – dump bucket, combining water and gravity in a way that’s sure to soak. Pools are places where the good times flow, and to make sure Carnival Breeze has enough good times for all, we’re including two pools. The resort-style pool provides the best seat in the house for kicking back and enjoying whatever’s playing at Carnival’s Seaside Theatre. Carnival Breeze’s aft pool area is the ultimate place to take a dip – in the pool or hot tub – while taking in the stunning scenery. Here’s the plot: You, watching a movie, on a giant screen, outdoors… while relaxing in a pool, or maybe lounging on a beach chair. Sound like a script you can get behind? Great – the role is yours! Get over to wardrobe (a bathing suit will do just fine) and then head to Carnival Breeze’s Seaside Theatre, where the viewing experience may trump just about all others you’ve experienced. Ooh, sorry about that. All grown up with no place to go? Not so! Carnival Breeze’s Serenity area lets adults spend time with other adults, far away from both stress and – you know – kids. We call it ‘Serenity’ for a reason and we mean it, so if you’re a relaxation enthusiast, this is the place you’ll want to be. Read a book, enjoy the view, sip something from the bar, or just spend some quality you-time – Serenity is your place to just be you. And is there any better place to be you than on a hammock? That’s an easy one! Ocean Plaza is the centrally-located perfect place to meet, eat, drink, and be entertained in an indoor/outdoor, islandy setting. Enjoy a full bar, coffee bar, or even snack bar… and of course, our FunHub Internet cafe. At Ocean Plaza, daytime activities include trivia and other games, with things heating up when the sun goes down – live music and dancing by night. Carnival Breeze’s Winner’s Luck Casino is the glitzy, glamorous place where even just passing through gives you that winner’s vibe. Feeling lucky? Head over to the Winner’s Luck Casino to try out a wide selection of slots and table games including blackjack, roulette, and a full hand of poker games. Carnival Breeze’s casino bar is the perfect place to kick back and take in some sports while recharging your batteries for another roll at the casino games. Renowned comedian and TV personality George Lopez helped pick the talent to deliver the laugh lines at The Punchliner Comedy Club, so come prepared for some lively stand-up humor of the ‘laughing-so-hard-I-can-barely-breathe’ sort. Nobody raises the roof like a great DJ, and that’s what you can expect aboard your cruise. Our scratch-n-spin masters have all been trained by the Miami Heat’s official DJ, DJ IRIE, to drop beats like the man himself all across the ship, from Liquid Nightclub to deck parties… and even events in between. You’ve played CONNECT 4 and YAHTZEE, but you’ve never done it onstage with the chance to win great prizes! You’ll get your chance with our onboard Hasbro Game Shows, which put a fun twist on these and other funtime favorites. 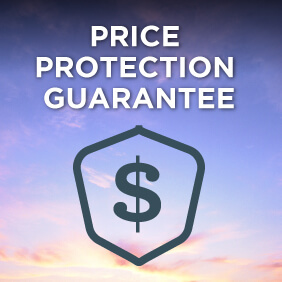 We won’t just treat you, we’ll treat you well. For the shortest path between here and fitness, ask our expert instructors for direction. Cloud 9 Spa isn’t just a spa, it’s a shrine to relaxation. Hope you packed your funny bone our onboard comedy performances are designed to tickle ’em just right. Settle in to a poolside lounge chair – or even the pool itself – as you take in a big-name movie under the stars. This intimate lounge features not only state-of-the-art self-serve wine dispensers for a good drink, but a selection of board games for a good time… and even books on the walls for a good read. When the house lights are up, Carnival Breeze’s Ovation Main Show Lounge – with its stunning decor – is a sight to behold. Once the lights go down, the room fades easily into the background while you enjoy the action onstage! Get your fill of nighttime entertainment in our fun-packed lounge. From The Punchliner Comedy Club to Superstar Live Karaoke and live music, here’s where it all happens. A bumpin’ nightclub on the high seas? Yep. At Liquid, you’ll find next-level decor, a full bar, and even an outdoor space where you can enjoy a break, a drink or maybe just a sea breeze. Carnival Breeze’s Liquid Nightclub not only features plenty of room to move your hips, but talented DJs spinning the latest tunes to help keep them going. Piano Bar 88 is the swanky, jazzy bar setting designed for laid-back, fun times. Let’s not forget the live music… and definitely don’t forget the drinks! When you find yourself at Carnival Breeze’s laid-back Piano Bar 88, don’t be surprised to also find yourself in the middle of a sing-along!